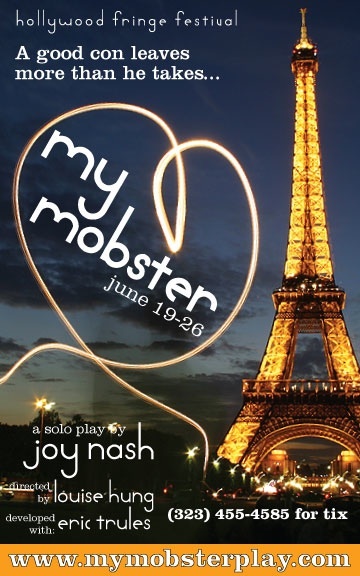 My Mobster premiering at Hollywood Fringe! I’m sorry for the long long delay, but I’ve been hard at work on my biggest project yet! My full length solo play is premiering at the Hollywood Fringe Festival and running from June 12-26. Tickets go on sale May 1st, so if you’re anywhere near the area, make sure you come check it out! If you’re not in the LA area, don’t despair! I’m applying to fringe festivals all over the US and hopefully I’ll be coming soon to a town near you!! Oooh, come to Minnesota! It’s too bad you aren’t premiering in May because I am coming to LA May 12-16! Drat. I wish I could get down there, but finances and Mr. Twistie’s gig schedule won’t allow. Congrats! If you make the Orlando Fringe I will be there with bells on. Break a leg!